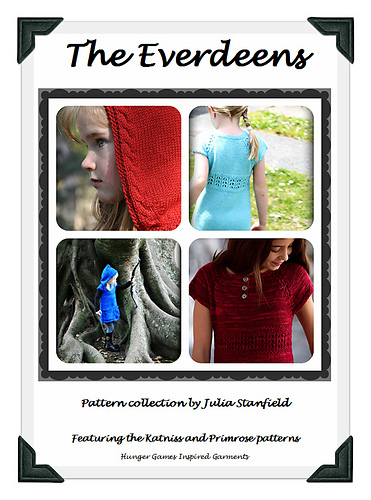 The ‘Sister Patterns’ have been united in this Hunger Games inspired e-book - The Everdeens. 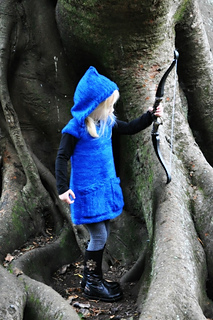 Katniss - released in June 2012 - is a striking yet simple and seamless pattern for a functional and fashionable tunic with cabled raglans, optional cabled hood and feature pockets. 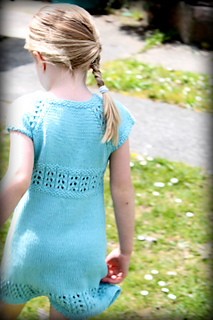 Primrose - released in November 2012 - The Little Sister Pattern To Katniss. Pretty. Feminine. Delicate. Primrose is a stylishly simple and seamless pattern, featuring sweet lace panels in the raglans, waist and hem. Katniss Perfect for hunting and gathering, or simply shopping or hanging out with friends.This tunic looks great with jeans or leggings, with sleeves or without and seems to please all girls! Katniss is a top down seamless raglan, with simple charts to follow whilst knitting the most challenging parts. It has been designed to be knitted using a solid or semi solid colour. Katniss can be knitted with either 8 ply/DK or 10 ply/worsted, however the fabric of the finished garment depend on the yarn you choose. 8ply/DK will result in a looser fabric with nice drape, 10ply/worsted weight will result in a tunic with a slightly more dense fabric. Primrose Great for layering with leggings or jeans in winter as a tunic, or knit in cotton for a pretty summer dress. Primrose is written in 11 sizes (NB - 10 years) and looks just as gorgeous on older children as it does on babies. It comes with three easy to follow options within the pattern for the empire waist band - lace, lace eyelet (looks lovely with a ribbon threaded through) and a no lace option. Designed to be knitted with a solid or semi solid yarn colour and all sizes use 3 feature buttons. Knitted top down and all in one piece. It can be knitted with either 8 ply/DK or 10 ply/worsted, however the fabric of the finished garment depends upon the yarn you choose.